Country Cards by Rose: Sparkle! OMGoodness! Have you seen the new Sale-A-Bration glimmer paper??? It's part of the next round of Sale-A-Bration items that Stampin' Up! promised us at the beginning of this amazing promotion. I love free stuff...so naturally I couldn't wait to get my hands on this gorgeous paper, and today I have a beautiful card for you that uses this new FREE product. I love all the ideas in that video - tons of inspiration, right? I hope this card tutorial inspires you as well. My friend BJ made this card, and I couldn't wait to share it with you! With Bermuda Bay cardstock measuring 11” x 4 ¼”, score & fold at 5 ½” for your cardbase. 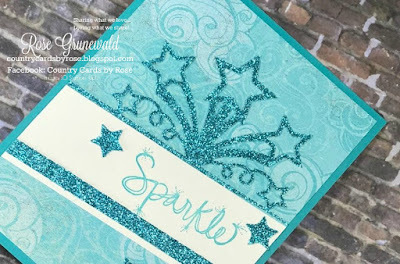 Stamp “sparkle” in Bermuda Bay ink on Very Vanilla cardstock towards the top edge. Adhere to Cupcakes & Carousels designer series paper with snail adhesive at a slant. Ends of the cardstock will hang off edges of designer series paper. Adhere ¼” x 4 ¾” Bermuda Bay Glimmer paper on top of Very Vanilla cardstock with snail adhesive. With wrong side of designer series paper facing up, trim edges of Very Vanilla/Bermuda Bay glimmer paper to match edge of designer series paper. 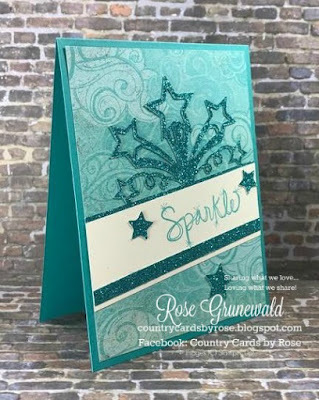 Using Star Blast Edgelits Dies, die cut star shape. Adhere to cardbase. 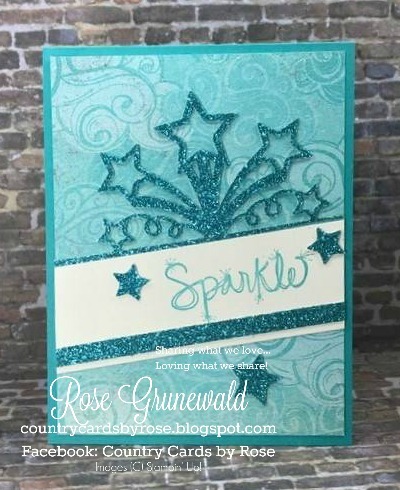 Attach stars that were leftovers from the Star Blast Edgelits Die cut on card with snail adhesive.